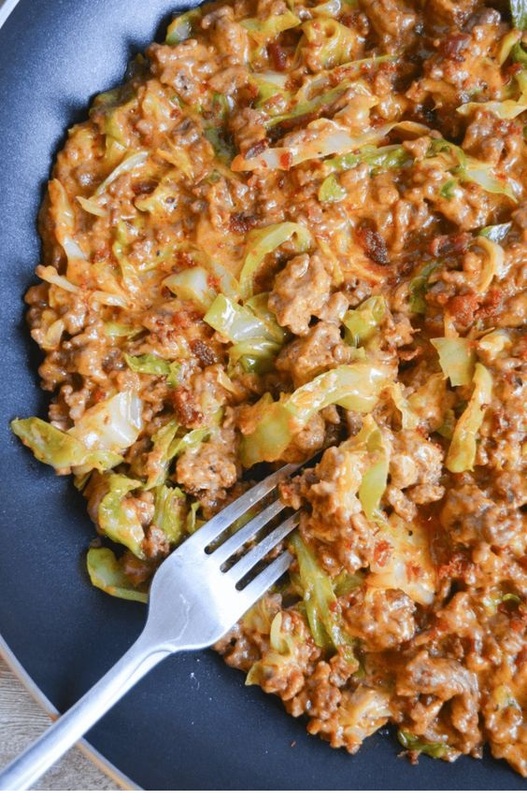 This Keto Cheeseburger Helper is a nostalgic meal with more nutrients and fewer carbs than the classic favorite. My family gobbled it up as quickly as I made it! In a large skillet or dutch oven, over medium heat, brown the ground beef until no pink remains, about 15 minutes. Drain the excess grease and return the skillet of ground beef to the heat. Add the paprika, onion powder, garlic power and your preferred amount of salt and pepper to the pan. Stir in the tomato paste and water. Place the shredded cabbage into the skillet and fold into the seasoned ground beef. Bring the mixture to a boil and cover. Allow the cabbage to cook for 15-20 minutes or until tender and translucent, stirring occasionally.